You must be a member of the Singapore Brunch Group to attend this activity. Would you like to join this group? Whether you're a foodie or not, you know that Jamie Oliver is synonymous with uncompromisingly fresh, sustainably sourced and whole foods cooking, so you’ll be glad to know that know his delicious dishes are also available at Protected content ! "Pasta is made fresh on-site daily; Jamie's classic planks of antipasti are as delish as they look; they cater to a wide range of dietary needs, and they're also wholly committed to using free-range, sustainably sourced produce. 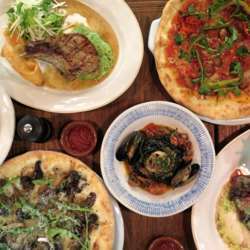 Highlights include Jamie's Italian Burger, Brixham Bay Crab Risotto, and their famous polenta chips." -Honeycombers. Let's have our next Brunch here!